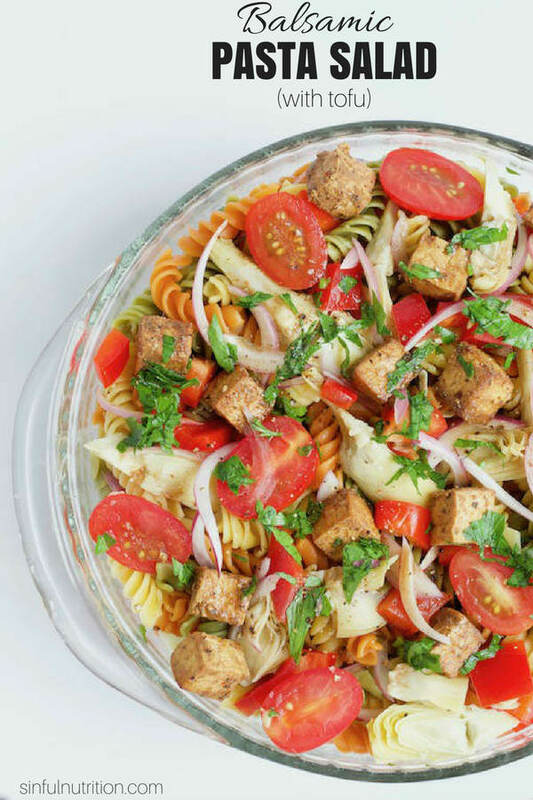 Balsamic Pasta Salad with Tofu — A classic summer recipe made with sweet and tangy balsamic vinaigrette, tri-color pasta, artichoke hearts, bell pepper, and Nasoya balsamic tofu. A vegan friendly side dish for any cookout or barbecue! I received free samples of Nasoya mentioned in this post. By posting this recipe I am entering a recipe contest sponsored by Nasoya, and am eligible to win prizes associated with the contest. I was not compensated for my time. Thanks for supporting the partners that keep Sinful Nutrition running! Soft or hard serve ice cream? I love them all. Creamy. Italian. Macaroni. Spaghetti (even ones made from zucchini). I don’t discriminate. 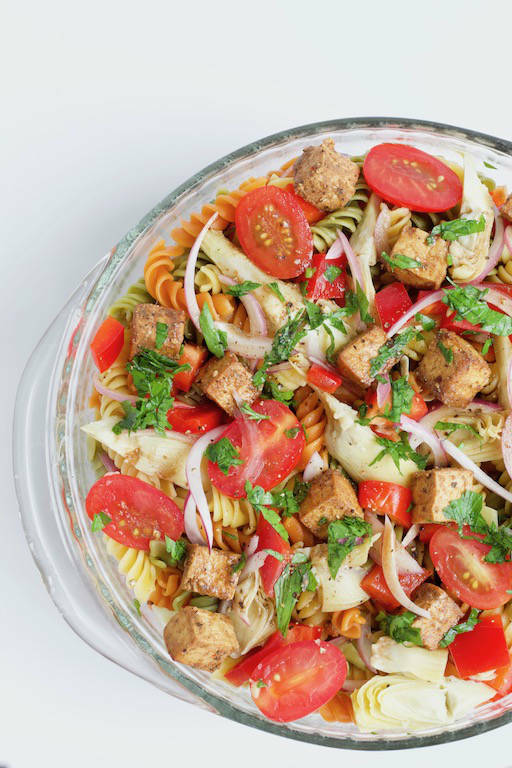 Guilty admission, every summer included (and still does) include a boxed pasta salad mix, jazzed up with tuna, peas, tomatoes, and hard-boiled eggs. Tastes like summer. But sometimes, I like to make it my own, especially when the box isn’t on the 10 for $10 deal that week. Use store brands. Utilizing store brands for staples such as pasta and salt, and pepper can be less expensive without sacrificing flavor or quality. Buy in the can. Marinated artichoke hearts are delicious, but tend to be more expensive too. Purchase the unflavored type in the can, and add more flavor with the dressing instead. Cook pasta according to package directions. Drain, and let cool for 5 to 10 minutes. Add pasta and remaining ingredients to a large bowl, and toss to coat. Refrigerate at least 30 minutes or overnight before serving. Sprinkle with additional chopped basil, before serving. Soft serve or hard serve ice cream? What a colourful salad! Love the crispy tofu addition! This looks so good! I love all the fresh flavorful ingredients! Pinned it to make this weekend. Wow great idea! 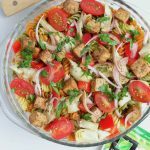 Makes pasta salad a whole meal if need be on a busy summer night! This looks so good!! Also – pasta salad, iced coffee, and any ice cream (although, being vegan has limited my options – probably the hardest thing about this lifestyle!). 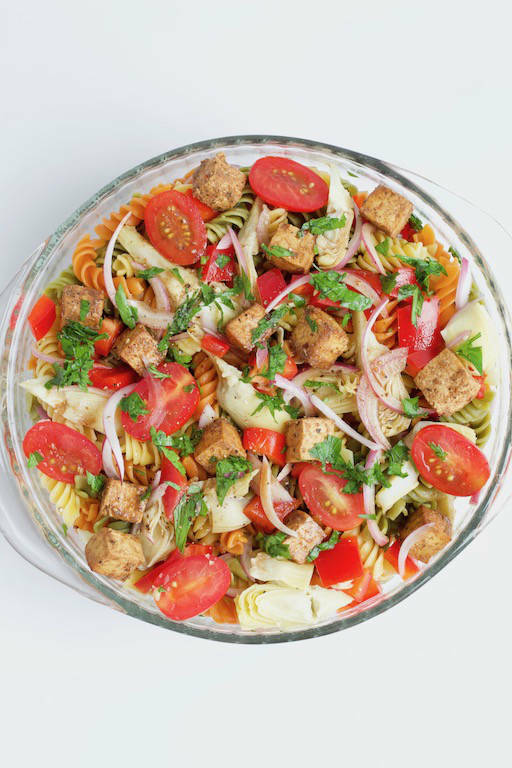 Have never tried tofu in pasta salad. Great idea!! 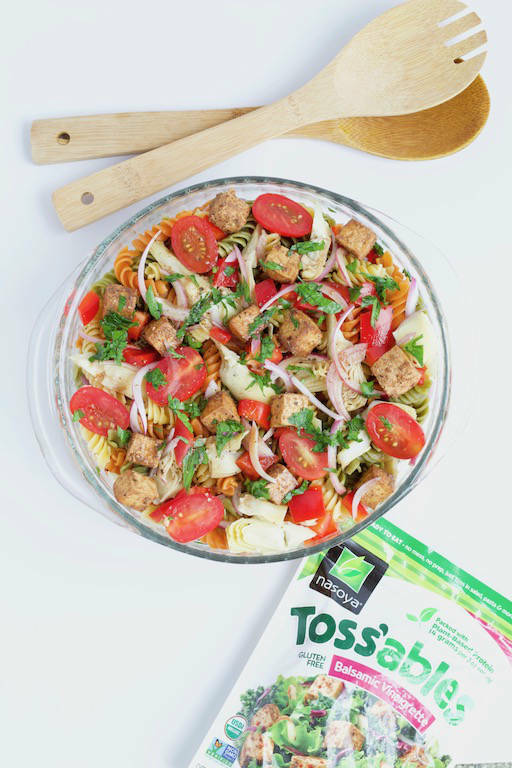 I have to get my hands on that balsamic tofu for salads, pasta and wraps!! I love that you added tofu! It’s so versatile! Yum! My girls would love this! 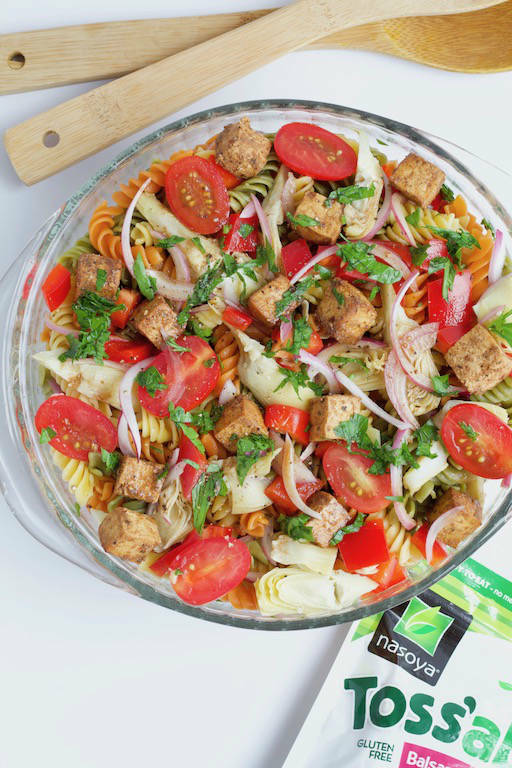 I love tofu and am always on the hunt for interesting recipes using it, this looks perfect! Im always looking for more plant-based salad ideas. This combo looks so delicious!